An Account of the Voyages undertaken by the order of His Present Majesty for making Discoveries in the Southern Hemisphere, and successively performed by Commodore Byron, Captain Wallis, Captain Carteret and Captain Cook, in the Dolphin, the Swallow, and the Endeavour [Together with:] A Voyage towards the South Pole, and Round the World. Performed in His Majesty's Ships the Resolution and Adventure, in the years 1772, 1773, 1774 and 1775 [Together with:] A Voyage to the Pacific Ocean. Undertaken by the command of His Majesty, for making Discoveries in the Northern Hemisphere [Together with:] KIPPIS, Andrew. The Life of Captain James Cook. London: G. Nicol and G. G. J. and J. Robinson, 1788. 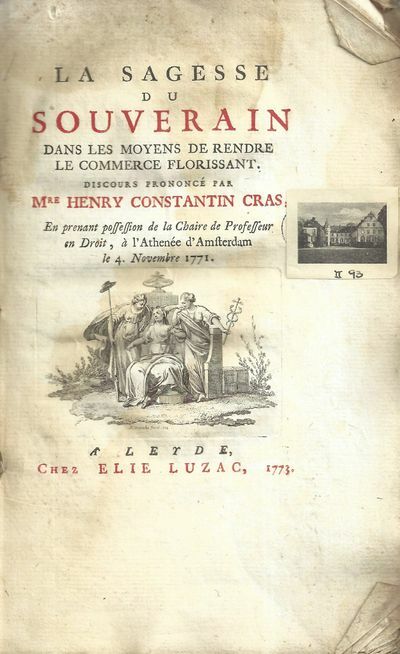 Anacréon, Sapho, Bion et Moschus, traduction nouvelle en prose, suivie de la Veillée des fêtes de Vénus, et d'un choix de pièces de différens auteurs. Par M. M***C**[. Begebenheiten des Enkolp. Aus dem Satyricon des Petron übersetzt. 2 Bände. The Passions Personify'd, in Familiar Fables. 8vo. London: Printed for J. Whiston and M. Lawrence, 1773. 8vo, contemporary full calf rebacked with later gilt-ruled, decoratively blindstamped calf. [ii], vi, 104 pp. Engraved frontispiece and twelve plates drawn and engraved by John Miller. Covers worn, hinges cracked, but a sound copy of an uncommon work inscribed. First Edition. Presentation copy, inscribed on flyleaf: "Henrietta Anne Fortescue / A Present from the Author". (Henrietta's signature appears on the title-page.) Halkett & Laing attribute this work to Edward Young, the author of Night-Thoughts; but everybody ascribes it to Herbert Lawrence, whose best-known work, The Life and Adventures of Common Sense: An Historical Allegory (first published in 1769 by M. Lawrence), uses a similar device of a personified Common Sense, who travels through time and comments on ancient and modern history. Edward Young, moreover, had died in April, 1765, so it would have been difficult for him to inscribe this copy in 1773. The twelve verse fables in the collection are ironic narratives involving such characters as "Honour, Vanity, and Content" and "Prudence, Dissipation, and Justice." NUC locates two copies of this work. Henrietta Anne Fortescue (née Hoare) was a Scottish artist; she died in 1841. New York:: Hugh Gaine,. 1773. , iii, , lxviii pp. With the half title, bound in later plain brown wrappers. Very Good. 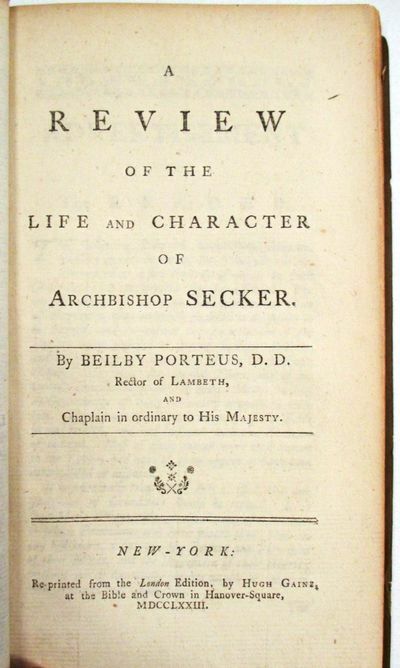 This is the first American edition, reprinted from the 1770 London, of the life and thought of Archbishop Secker, defender of the Episcopal faith in America. Secker was thus the adversary of Jonathan Mayhew and Charles Chauncy, who resisted his attempts to 'Episcopize' America. This eulogy scolds them for their "unreasonable and groundless Jealousies of the Church of England." Mayhew's opposition to "the Proposal for appointing Bishops in some of the Colonies" wholly misunderstood Secker's motives for the appointments, there being no intention to render the Church of England the established religion in America. FIRST AMERICAN EDITION. Evans 12960. NAIP w029061. Observations concerning the distinction of ranks in society. Under the following heads: I. Of the rank and condition of women in different ages. II. Of the jurisdiction and authority of a father over his children. III. Of the authority of a chief over the members of a tribe or village. IV. Of the power of a Sovereign over an extensive society. V. Of the authority of a master over his servants. ... The second edition, greatly enlarged. 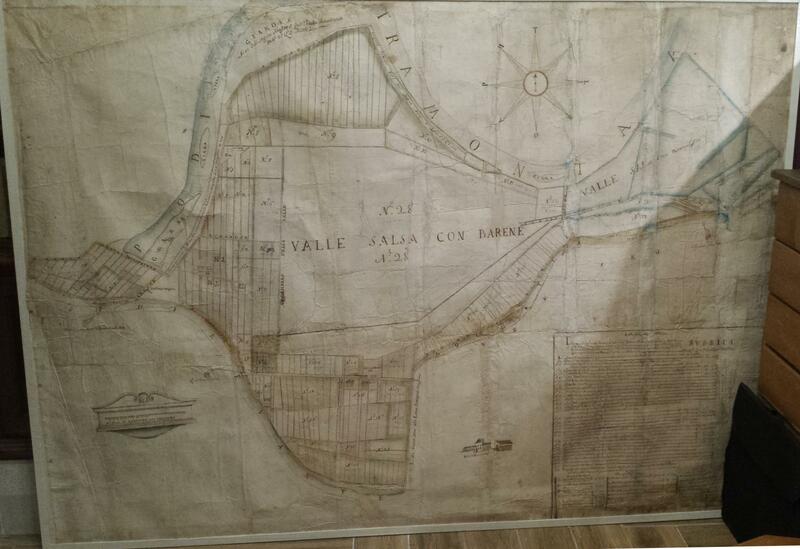 London: J. Murray, 1773. 8vo., (4) + xxii + 312pp., complete with the half-title and with the supplementary errata slip pasted onto foot of p. xxii, some leaves in signature F bound in wrong order (affecting pp.85-96), but all leaves present, a light marginal dampstain in first two leaves (i.e. 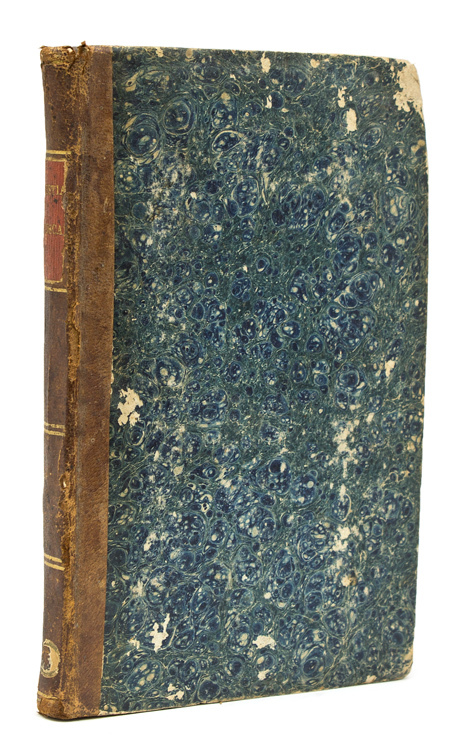 half-title and title), handsomely rebound in the 18th century style in quarter calf over marbled boards, spine gilt and labelled with raised bands, vellum tips on fore-corners. A most attractive copy. 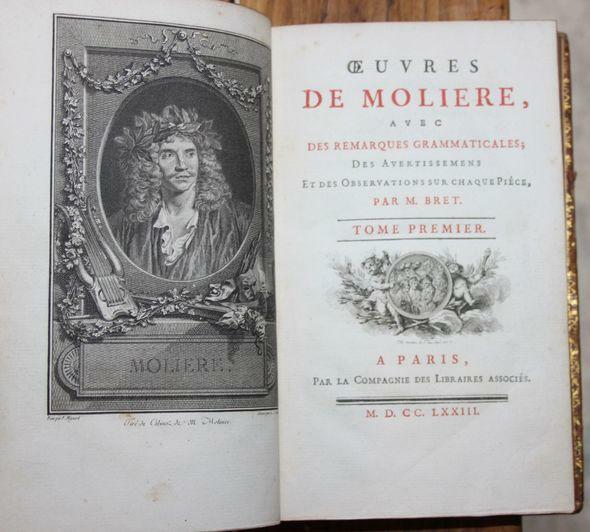 Millar's most important work, first published in 1771. It contains 'a number of ingenious, progressive and penetrating ideas' [Hideo Tanaka in Dictionary of 18th Century British Philosophers>, vol.II, 1999, p.617]. 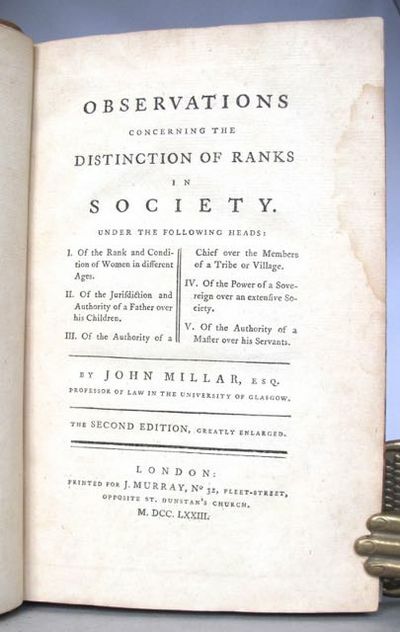 'In tracing the history of the distinction of ranks and upholding the personal liberty of the lower classes, Millar does not advance simple social theories such as materialism, climate or economic determinism; rather, he develops what might be called the multi-causal theory of society. He combines the characteristics of human nature and advancement of humanity with social, political and economic circumstances. Thus he synthesizes the real and the ideal in man and society. His synthesis is quite penetrating, and was highly regarded'. [op.cit. pp.617-618]. According to other commentators Millar's work was one of the earliest and finest examples of an empirical approach to sociology and shows both the influence of Montesquieu and of Hume's The Populousness of Ancient Nations>. Rendall [The Origins of Modern Feminism>, 1994] thought that Millar's was, for example, 'one of the most interesting of all 18th century historical studies of the condition of women'. 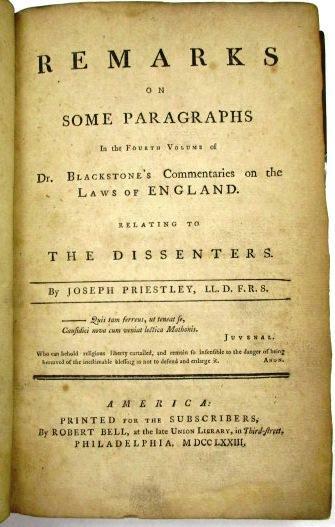 This second edition is an almost unmodified reprinting of the first of 1771. 'The revisions and additions in the second edition are, with two or three exceptions ..., of minor significance, consisting chiefly of stylistic improvements, the occasional re-structuring of a paragraph, and the breaking down of the chapters into sections.' [William C. Lehmann, John Millar of Glasgow>, 1960, p.167]. It was Lehmann's view that Millar's Observations>, together with his equally important Historical View of the English Government> (1787), were 'characterized by a pervasive attempt to trace causes and effects in historical phenomena and by a strong emphasis upon the influence that economic factors have in shaping social and political institutions. Because of this stress on economic factors, some have seen in Millar's work a marked anticipation of Marx's historical materialism. Perhaps it would be fairer to see in it, with A.L. Macfie of Glasgow (1961)*, both a further development of the thought of Adam Smith, with differences in emphasis, and an important bridge between eighteenth and nineteenth century social thinking in general'. [I.E.S.S.>, vol.10, p.349]. *A.L. Macfie, John Millar: a bridge between Adam Smith and 19th Century social thinkers?>: Scottish Journal of Political Economy 8: 200-210. Discurso Sobre a Inutilidade dos Esponsaes dos Filhos Celebrados. Gesamtansicht ('Bremen die Weser hinauf'). An Introduction to the History of Great Britain and Ireland : Or, An Inquiry Into the Origin, Religion, Future State, Character, Manners, Morality, Amusements, Persons, Manner of Life, Houses, Navigation, Commerce, Language, Government, Kings, General Assemblies, Courts of Justice, and Juries, of the Britons, Scots, Irish, and Anglo-Saxons. The Third Edition, revised and greatly enlarged. Dublin: Thomas Ewing, 1773. 3rd Edition . Hardcover. Very Good/No Jacket. 12mo - over 6¾ - 7¾" tall. In brown leather with five raised bands and black leather title label to spine. Hinges weak; front cover attached by only one cord. Two small owner signatures to front endpapers, no other writing, plates, damage, foxing, water stains, or other indignities. Not ex-library. Text block beautifully preserved and in near-fine condition. Rare. Birmingham, dai torchi di G.Baskerville per P.Molini, 1773. 4 volumi in-4, illustrati da 1 ritratto dell'A. di Eisen inc. da Fiquet e 46 figure in stupende tavole fuori testo, di Cipriani, Cochin, Eisen, Greuze, Monnet, Moreau incise da Bartolozzi, Choffard, Duclos, ed altri. Celebre edizione dell'Orlando Furioso. (La carta di questo esemplare è lievemente brunita come nella maggioranza delle copie conosciute). Esemplare in eccezionale legatura italiana di fine settecento: pieno marocchino granata, piatti con larga bordura in oro, riquadrata da filetti e dentelle, formata da tralci, rami, bocciuoli, fiori, e con ai quattro angoli altrettante corone di lauro in ruote a dentelles. Dorsi a nervi, fregi oro negli scomparti, tasselli in marocchino verde per il titolo, tagli dorati, dentelle sui tagli dei piatti. Preziosa e perfetta legatura italiana, di importante atelier romano, decorata con finissimi inusuali piccoli ferri, esente dal minimo difetto.. .
Landgrafen von Hessen-Kassel. Schwarze Tusche auf handgeschöpftem Bütten. Portraits jeweils unterhalb betitelt: "Fréderic II Landgrave de Hesse" und "Philippine Landgrave de Hesse". Im Stil eines Scherenschnittes angefertigte Profildarstellung von Friedrich II. Landgraf von Hessen sowie Philippine Auguste Amalie Landgräfin von Hessen mit ovaler Einfassungslinie, entstanden zwischen 1773 und 1785. - Der Monarch wurde vor allem durch die Vergrößerung des Heeres und die Bereitstellung von 19.000 Soldaten an die englische Krone bekannt. Der Sachverhalt des damals als skandalös empfundenen Soldatenhandels wurde von Friedrich Schiller in seinem Theaterstück "Kabale und Liebe" aufgegriffen. Philippine von Brandenburg-Schwedt war die zweite Ehefrau des Landgrafen, der sich durch die Heirat größere Unterstützung für seine Ziele durch Preußen erhoffte. - Im oberen Bildbereich mit kl. Tintenspuren von rückseit. Bezeichnung. 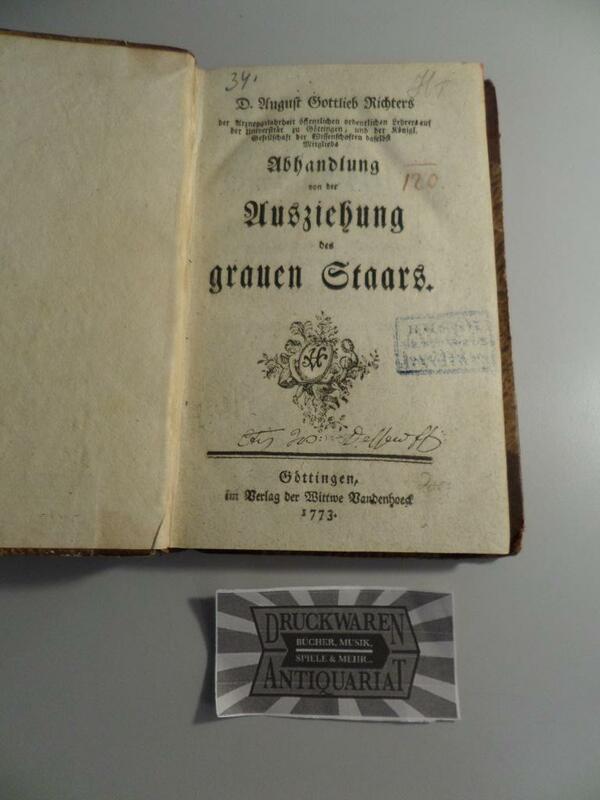 [Nuremberg], 1773. Engraving, coloured by hand, by J.J..Haid. Very good condition. A very fine image from Trew's 'Plantae Selectae', one of the greatest of all eighteenth-century botanical books, drawn by the greatest of eighteenth-century botanical artists, George Dionysius Ehret. Linnaeus, wrote to Trew, in Latin, that "The miracles of our century in the natural sciences are your work of Ehret's plants...nothing to equal them was seen in the past or will be in the future. "Christoph JakobTrew, a physician and botanist, had for a number of years been an admirer of Ehret's work. Ehret, a brilliant botanical artist, was unrivalled in his ability to "achieve realism, majesty, ineffable colour, all in one breathtaking look." (Hunt). Born in Heidelberg in 1710, he originally worked as a gardener and practised drawing in his spare time. His artistic abilities led him to the service of a Regensburg banker named Leskenkohl, and it was during this period that Trew met Ehret.Trew was to remain a friend and patron of Ehret's throughout his life, and by 1742, the germ of what was to become the present publication was already under discussion when Trew wrote to Christian Thran in Carlsruhe "Every year I receive some beautifully painted exotic plants [by Ehret] and have already more than one hundred of them...."Ehret moved to London in the late 1730s, where he painted the recently introduced exotics at the Chelsea Physic Garden and established himself as a teacher of flower-painting and botany. Discussions about the projected work continued by letter until 1748, when Johann Jacob Haid from Augsburg agreed to produce the engravings from Ehret's drawings.Gerta Calman Georg Ehret, Flower painter Extraordinary (1977) p.97; Dunthorne 309; Great Flower Books(1990) p.144; Hunt 539; Nissen BBI 1997; Pritzel 9499; Stafleu & Cowan TL2 15.131. Boston: J. Kneeland, 1773. 35pp. Half title. Modern half morocco and marbled boards. Ownership inscription on half title partially erased. Trimmed close at bottom edge, minutely affecting some text. Lightly soiled. Still very good. The first portion of the text is turned over to an interesting summary of the case for pre-Columbian European knowledge of the Americas, the possibilities of ancient migrations, and so forth (including passing references to Atlantis). The second portion of the text is devoted to inequities in British treatment of the colonies. ADAMS 98. HOLMES 61. EVANS 12861. SABIN 46792. HOWES M408, "aa." Neufchatel, 1773. 8 voll., in 16°, p. pelle, ogni vol. è di ca. 450 pp. + 37 inc. Testatine e finaline. Tagli marmorizzati. Lettere e fregi ai dorsi in oro. Stampa fresca. Lievi gore sul margine di alcune pp. dell'ultimo vol. che non ledono il t. Piccole mende ai dorsi e leggere abrasioni ai piatti . Raro nella sua completezza. Dell'Epidemica Mortalità de' gelsi e della cura, e coltivazione loro trattato. Bartolomeo Richetti, 1773. In 8°, cart. muta, pp. XIX + CXCI. Carta forte. Ampi marg. Barbe. Front. fig. Testata, capilettera su piccole ma pregevoli inc. " L'autore descrive assai bene questa malattia, ne va esaminando le cagioni, indi si diffonde a ragionare con molta intelligenza della coltivazione migliore di questi alberi". De l'homme et de la femme consideres physiquemenu dans l'etat du mariage. Henry, 1773. 3 voll., in 16°, p. pelle, pp. XI + 500 + 358 + da 359 a 695 + 12 inc. n. f. t. Nervetti. Lettere e fregi ai d. in o. Tagli rossi.Sono mancanti le inc. n. 1, 11 e 15. Lievi mende alle copp. Antichi forellini che interessano poche lettere. 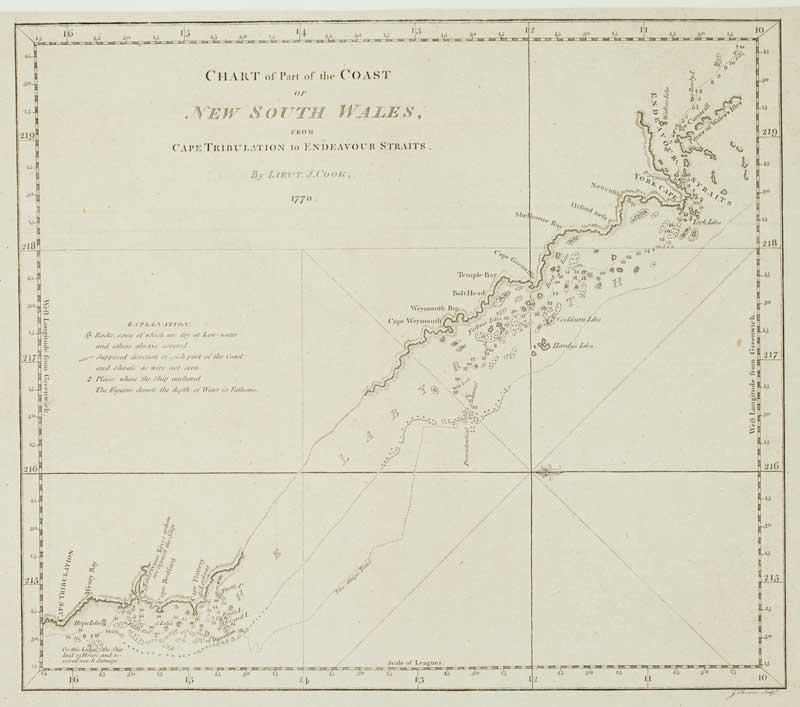 Chart of Part of the Coast of New South Wales, From Cape Tribulation to Endeavour Straits. By Lieut. J.Cook, 1770. Leiden, Elie Luzac. 1773. Paperback. First edition. Blue paper wrappers. 8vo. 4, 84 pages, 22 cm. In French. Title translates to Â“The Wisdom of the Sovereign in Finding Ways to Establish a Flourishing Trade. Â” Title in red and black and with engraved vignette. The author describes here the economies of different countries during the course of various eras. He posits that freedom of religion is one of the prerequisites for creating a prosperous national economy, examples of failure in that regard is France- who drove out the Huguenots and Spain and Portugal who expelled the Jews. Â“Certainly the Inquisition is blind, superstitious and cruel for pushing the Jews to desert Portugal and Spain - [eventually] bringing them to Amsterdam, where wise-men welcomed them with kindness. There, the [Jews] encouraged flourishing trade practices which they spread around the world, while in Spain and Portugal [trade] collapsed. That is why in order to populate our provinces and have them grow prosperous, our wiser nations should welcome the strangerÂ… and let all freely practice his religionÂ” (p. 16) . A copy sold at auction for USD 984 in 2016. Significant dampstaining and edgewear. Minimal pencil markings that do not affect text. Later tiny photo of a house added to title page. Good condition. (FR-3-5) . Paris , Par La Compagnie des Libraires Associes, 1773 - 2 nn.Bl., Porträt-Frontispiz, VIII., 520 S., 4 Tafeln, Titelvignette ; 2 nn.Bl., 576 S.,Titelvignette, 6 Tafeln; Vortitel, 552 S., Titelvignette, 6 Tafeln; Vortitel, 560 S., Titelvignette, 6 Tafeln; 2 nn.Bl., 774 S., 2 nn.S., Titelvignette, 5 Tafeln; 2 nn.Bl., 704 S., 6 Tafeln, Titelvignette Einbände berieben und bestossen, Goldschnitt ebenfalls stellenweise beschabt. Außengelenke mit Lederstreifen verstärkt, Innengelenke teilweise verstärkt. Bei Band 3 und 5 ist der Buchblock zwischen Vorsatz und Vortitel gebrochen (keine losen Seiten), Bei Band 4 ist der Vorderdeckel lose. Die ersten und letzten ca. 4 Blatt etwas fleckig, innen ansonsten bis auf einzelne Fleckchen saubere Exemplare. Die Restaurationsarbeiten wurden eher dilettantisch ausgeführt, eine Besuch beim Buchbinder empfohlen. Insgesamt befriedigender Zustand. Sprache: Französisch Gewicht in Gramm: 4000 Kalbsledereinbände, umlaufender Goldschnitt, ca. 13,2 x 20 cm 6 Bände (=so komplett), im Jahr der Erstausgabe erschienen, mit insgesamt 34 Kupfertafeln (incl. Frontispiz). E Typis Franc. Ambr. Didot, 1773. Ubi, maxima Materiae affinitate, breviter de Fracturis, & de Vi quam Natura impedit in offibus elongandis, dum crescunt. Autore Michele Troja, Medicine Doctore Neapoli, & Chirurgo è latere in Regali S. Jacobi Nosocomio. Viro Clarissimo Josepho Lieutaud, Potentissimi Galliarum Regis Archiatro, Regiae Scientiarum Parisiensis, necnon Londinensis Academiae Socio, etc. etc. etc. Con 3 tavole ed una tabella ripiegate. Testatine e finalini incisi. Testo in latino. Allegato: ''Riflessioni del signor De La Lande sulle comete che possono approssimarsi alla terra. Traduzione dal Francese. Napoli, nella Stamperia di Giovanni Gravier 1773. 16mo. pp. 240 - 30. . Molto buono (Very Good). Pagine ben conservate, con rare fioriture, ampi margini, carta pesante. Ottimo esemplare. Prima edizione (First Edition). .
A Journal of a Voyage to the South Seas, in His Majesty's Ship, the Endeavour. Faithfully transcribed from the Papers of the late Sydney Parkinson, Draughtsman to Joseph Banks, Esq. 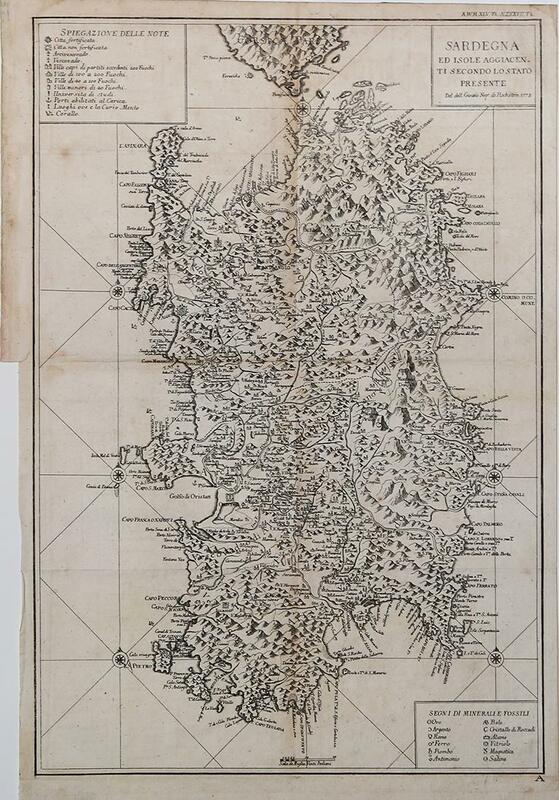 on his late Expedition, with Dr. Solander, round the World..
London: Printed for Stanfield Parkinson, the Editor, 1773. With offsetting from the plates as often; corner torn form one leaf without loss (p.37); some rubbing to boards especially at edges.. Large quarto, with frontispiece portrait, a map and 26 plates; completely uncut and partly unopened; an exceptionally large copy in its original binding of blue-grey paper boards, plain paper spine carefully renewed; in a folding cloth case. A really exceptional copy of the first edition of the most handsome of the unofficial accounts of Cook's first voyage. Copies of the first edition of Parkinson are invariably quite large with generous margins (and are often misleadingly catalogued as "Large paper" - in fact there were no "small paper" copies, only copies cut down by the binder), but the book is virtually never seen as here, completely uncut in its simple original binding. The spine has been replaced with appropriate plain paper. For the record, this copy measures 380 x 95 mm (binding) and 362 x 292 mm (bookblock).Parkinson, the son of a Quaker brewer of Edinburgh, was apprenticed to a draper when his ability for drawing 'flowers, fruits and other objects of natural history' first attracted the attention of Sir Joseph Banks. Banks engaged him as botanical artist on Cook's first voyage, and he went on to produce an important series of magnificent botanical and natural history drawings, and was the first professional artist to set foot on Australian soil. He died at the end of the voyage, en route from Batavia to the Cape of Good Hope.Parkinson's is the most handsome of the unofficial accounts of Cook's first voyage; it contains extensive accounts of New Zealand and Australia, and has some of the earliest natural history observations on the region, including the first published use of the word kangaroo (as "kangooroo", p. 149). 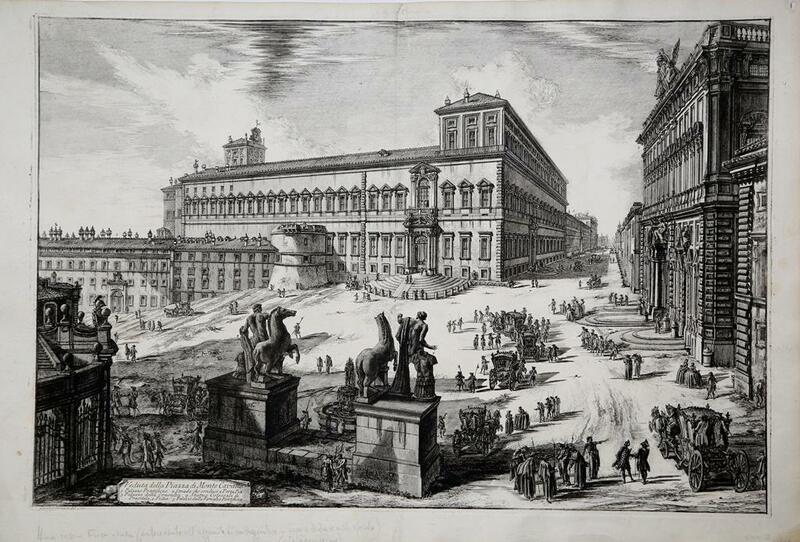 Parkinson himself was responsible for the original drawings for twenty-three of the twenty-seven plates here. His original artwork and these splendid engravings made from it represent one of the chief visual sources for Cook's first voyage, and one of the first views European observers had of such South Pacific scenes. 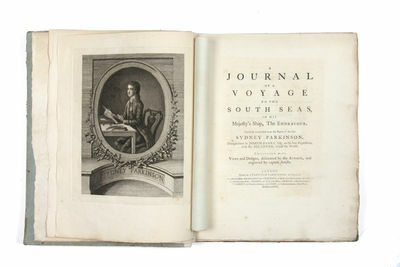 Parkinson's journal of the voyage is plain and unaffected, and in the words of its editor 'its only ornament is truth, and its best recommendation characteristic of himself, its genuine simplicity'. Curiously, as the botanical drawings were retained by Banks, none of his botanical drawings appear in his own account, and not until recent years has the world at large learned of Parkinson's genius as a botanical artist. Provenance: Private collection (Sydney). 1773. BIBLE. 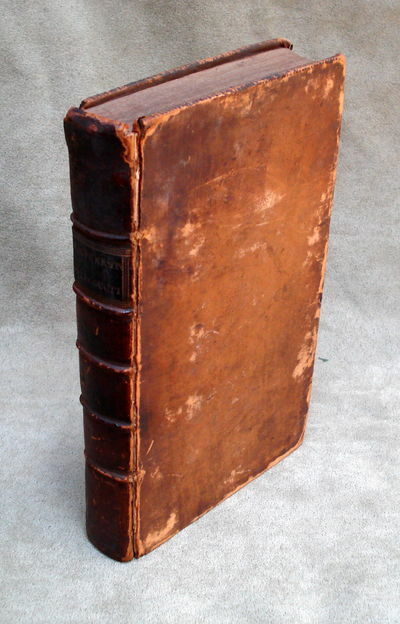 The Holy Bible, Containing the Old and New TestamentsÂ… London: Charles Eyre and William Strahan, 1773. 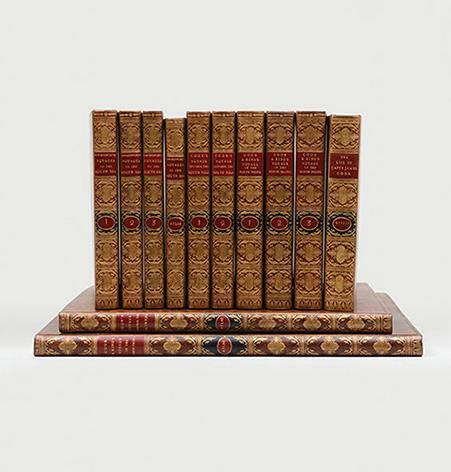 Thick quarto, contemporary full red calf, elaborately gilt-decorated spine and boards, marbled endpapers, all edges gilt. $4800.1773 edition of the magisterial King James Bible, Â“the most celebrated book in the English-speaking worldÂ” (Campbell, 1), handsomely bound in contemporary calf-gilt.Â“Other translations may engage the mind, but the King James Version is the Bible of the heartÂ” (Campbell, 275). First published in 1611, the King James Version has exercised incalculable influence on piety, language and literature. Macaulay praised it as Â“a book, which if everything else in our language should perish, would alone suffice to show the whole extent of its beauty and powerÂ” (PMM 114). With Apocrypha. With separate New Testament title page dated 1772. Herbert 1228. Family record opposite New Testament title page.Scattered light foxing. 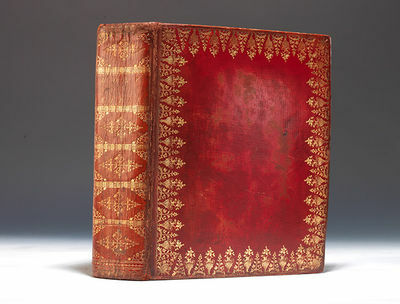 Contemporary calf gilt binding attractive with light expert restoration, expert repair to front joint, later endpapers. Königliche Palast ('Palacio Real de Aranjuez. - Visto desde la Calle del medio que pasa entre los Quarteles de Guardias de Infanteria - Por D. Domingo de Aguirre Capitan de Infanteria Ingeniero Ordinario de los R. E. Plazas y F. - Delineado en el Ano de 1773. - D. Manuel Salvador y Carmona, Pensionado de S. M.y Gravador de Francia, lo gravó en Madrid.'). - Kupferstich v. D. Manuel Salvador y Carmona, dat. 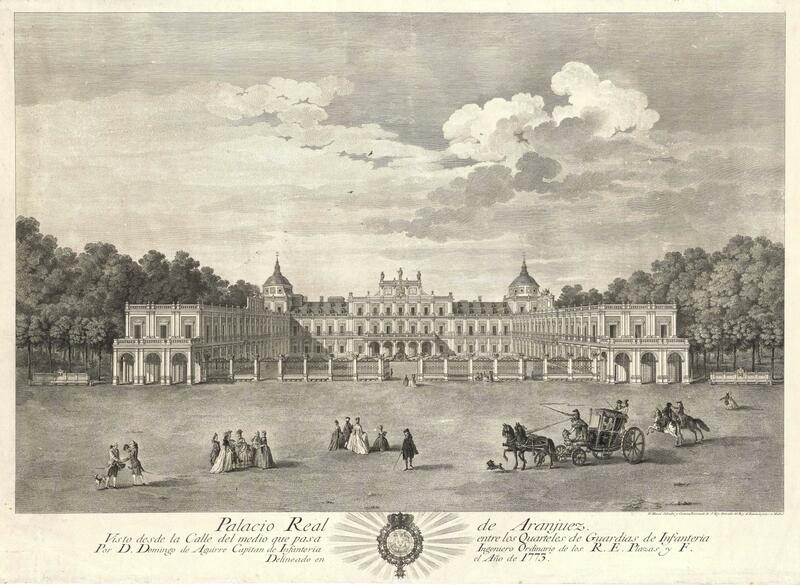 1773, 54 x 72,5 Zeigt den königlichen Palast (Palacio Real) in Aranjuez südlich von Madrid- Im Vordergrund dekorative Personenstaffage und Kutsche. - Unter der Ansicht vierzeilige spanische Bildunterschift; dazwischen spanisches Wappen. Conferenza del signor Le Brun primo pittore del Re di Francia con le figure disegnate da me Abr. David Nizza l'anno 1773. Manuel métallotechnique, ou Recueil de Secrets & de curiosités sur les métaux & les minéraux, appliqué aux arts & aux métiers. - Technik: Radierung auf Papier. Werkverzeichnis: Engelmann 98. Grösse: 2,1 x 14,9 cm (Darstellung). Weitere Größen: Papier: 7,1 x 18,9 cm. Beschreibung: Besonders seltenes Blatt. Das Original mit der deutlich sichtbaren und schwebenden Kugel auf der Spitze des Kummet des zweiten Pferdes und mit den Sporen des hinteren Reiters, wie von Engelmann für die Originale angegeben. "Von der grössten Seltenheit, da nur wenige Abdrücke gemacht wurden und die Platte abhanden kam." (Engelmann 1857, S. 69). Es handelt sich um einen Gesamtpreis inkl. Versandkosten innerhalb der BRD. Umsatzsteuer wird wegen Differenzbesteuerung nach §25a UstG weder erhoben noch ausgewiesen. Om Handelens Rettelse og Forbedring efter Rigernes Tarv. Ved egne og andres Erfaringer eftertænkt og skreven ved Even Walo. 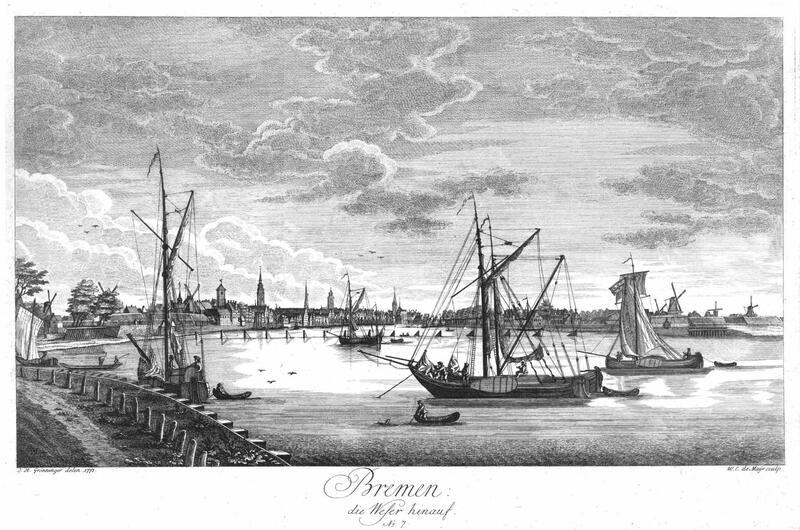 Kiøbenhavn, Trykt hos A. F. Stein, 1773. 54 s. Nyere priv. kartonert bd. med skinn tittelfelt på forperm. Litt brunplettet. Oluf Næve el. Ole Pedersen Nefue, født i Meldal. London : Printed for W. Strahan, J. and F. Rivington, J. Hinton, L. Hawes and Co. W. Johnson, S.Crowder, T. Longman, B. Law, G. Robinson, and T. Cadell, MDCCLXXIII. 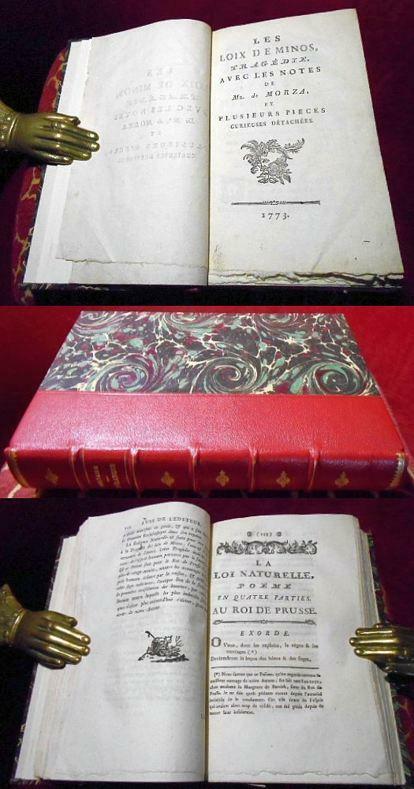 , 1773, Hardcover, New edition. Good to very good copy in the original full, aniline calf. 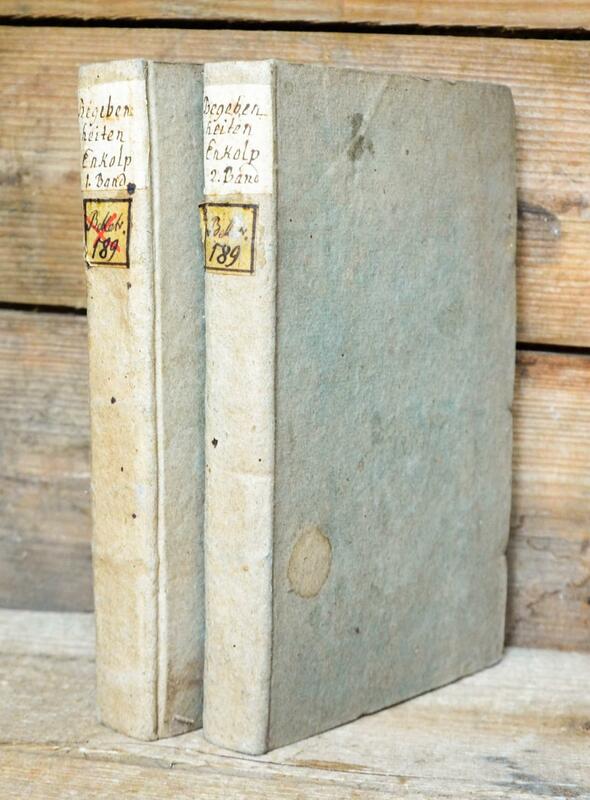 Gilt-blocked, contrasting red morocco label; spine compartments uniformly tooled in gilt. Hinges starting with minor, generalized wear to the extremities. Scans and additional bibliographic detail on request. Physical description; vii, , 252, , 40p., plates (folding). Notes; The supplement to the lectures has separate pagination, but the register is continuous. ESTC citation no. : N19867. Subjects; Mechanics - Early works to 1800. Optics - Early works to 1800. Globes - Early works to 1800. Sundials. Eclipses. Dialing - Early works to 1800. Hydrostatics - Early works to 1800. Pneumatics - Early works to 1800. Genre; Illustrated. 252 pages. Inventory No: 235148.